Go Ape South Africa is an aerial forest park (AFP) built to be enjoyed by all ages. Go Ape South Africa is an aerial forest park (AFP) built to be enjoyed by all ages. This park contains courses made of platforms constructed at various levels in the trees. The platforms are connected by different types of bridges (that represent obstacles), participants using safety equipment maneuver from platform to platform. The parks operate with virtually no negative environmental impact and the trees (our most important assets) are well cared for and protected. 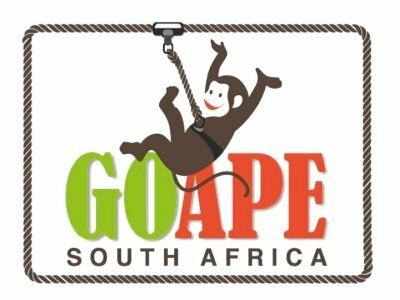 Go Ape South Africa brings people together as it is a fun way to spend quality time with friends, family and colleagues. Customer’s friendships will grow while on the course at the same time that they are developing both physical and psychological strength without even realizing it. Go Ape South Africa‘s courses and equipment is of the highest international standards. Go Ape South Africa and its employees take the safety of our clients very seriously. We have imported the best safety equipment from Germany and we guarantee that no participant will fall off our course. A full safety briefing will be given to all participants prior to the start of the course. Participants will be provided with a safety harness fitted to your size. Trained guides will clip and lock the participants onto the course using a specialised key, participants must be unlocked by one of the Go Ape South Africa Guides before being able to disembark from the course. Guides will patrol the course at all times assisting the less capable participants as well as ensuring that all participants are following safety rules whilst having fun in the tree tops. All of the equipment used on the Go Ape South Africa course conforms to international safety standards. WHAT YOU HAVE TO LOOK FORWARD TO!!! Please fill out the form and we will get back to you. Winter operating Times - 08:00 - 17:00, Last participants to start courses at 15:00. An assortment of cheese puffs, Mediterranean chicken puffs, chicken samosas, vegetarian samosas and mini pizzas. Lawn Games are offered to our corporate and large bookings. While some participants are on our tree top courses, others will engage in thrilling lawn games to get the team building vibe going. "An effective team depends on how focused and clear the goal of the team is. A relaxed, comfortable and accepting environment and finally, open and honest communication are required."